Want to make pasta in your home. No worries. It’s now even easier to make pasta than ordering and waiting for it. You just need to make sure that you got the best pasta maker in your kitchen. For that, we brought this list of 10 best pasta maker with their detailed review. This list includes the best pasta makers with durability, efficiency and useful features that we picked after testing and using the product on our own. Read our whole review and buy one now. Pushing this machine beyond its limit can cause overheating. A Little bit expensive compared to other similar models. Cutting rollers are not labeled, so people get confused which type pasta each roller makes. Ovente Vintage Stainless Steel Pasta Maker is the first pasta maker on our 10 best pasta maker review. It’s an outstanding performer and has amazing power to handle workloads. It allows you to make lasagna, Fettucini, noodles and different shaped pastas without any professional help. This pasta maker comes with seven adjustable rollers which will make sure the accurate thickness of dough. Though it’s a manual pasta maker if you want you can add pasta motor to it. It comes in four different colors, two sizes option 150mm and 180mm, seven setting thickness attachments. The machine has a pasta rack where you can store all parts of the machine. Besides, this machine is fully made of stainless-steel and plastic handle give full comfort while turning the handle to crank out the pasta. The price seems higher than other pasta makers. Getting fresh and tasty pasta with Gourmia GPM100 Electric Pasta Maker is just a matter of minutes. Pour whole wheat or gluten-free flour or whatever you like into the device, then add liquid. Choose a shape and the machine will start making your pasta. You can make Fresh spaghetti, Creamy Fettuccini Alafunhgi and other restaurant dishes in the home with this machine. It comes with a high-power motor capability, six select PastaMazing die disk, two measuring cups for measuring the ingredients and a recipe book. This amazing pasta maker is extremely durable and can fit perfectly in any modern kitchen. This Kitchenaid KPRA Pasta Roller can provide you tasty and healthy pasta in your home with no mess. It can work with any Kitchenaid mixer stand so you don’t have to stress about using it. The pasta maker has six different attachments that will fit on your Kitchenaid stand mixer hub, attachments include pasta roller, lasagnetter cutter, cappelline cutter, ravioli maker and spaghetti cutter. It is made of stainless-steel so you don’t have to worry about its durability. Besides, it comes with 1-year warranty. Using and cleaning Kitchenaid KPRA Pasta Roller is very easy and a cleaning brush also comes with the pasta maker. This one is really an excellent performer and can give you the best experience of making pasta in your home. You can prepare spaghetti, angel hair, fettuccini, lasagnette and ravioli with this pasta maker. Made of chrome coated steel and that makes it both easy to clean and durable. This pasta maker doesn’t require any baths because pasta doesn’t leave any residue. A cleaning brush comes with this machine. This pasta maker has seven setting you choose any and main body is designed to flatten dough to the thickness that you choose. Start with the thickest for the best result. This machine is very sturdy and getting a pasta maker like this means you are investing on the perfect thing. Some user had a hard time when fitting the attachment to the slot. There are some people who want a pasta maker within an affordable price but with good features and love vermicelli or fettuccine. For them, we have Norpro Pasta Machine, which is both cheap and efficient in making the best homemade pasta. This pasta maker is medium in size, not so big or small. That’s why placing it on your table or countertop won’t be an issue. Although this Norpro Pasta machine is very easy to use, a basic manual comes with the machine. Besides, cleaning this pasta maker is also very easy. You can use this machine for any type of dishes. Despite, the maker being very durable, the price surprisingly low. 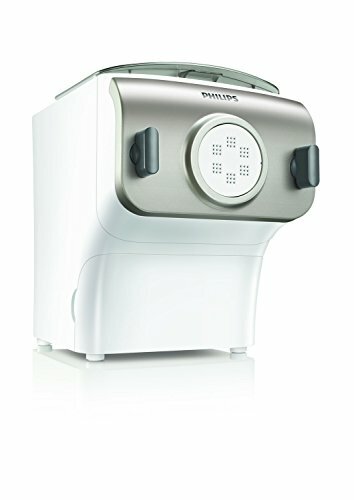 People who don’t know how to make pasta in home but wants to learn, Norpro Pasta Machine is an affordable option for them. This pasta maker is very heavy. Atlas brand is serving high-quality kitchen products for very long, this one is also a great production from their factory. 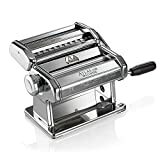 If you want a pasta maker which will make fresh pasta within a matter of minutes, without any mess and will last longer, then this Atlas Electric Pasta maker is for you. Motor-based pasta maker usually not last very long but this one will last much longer. It has removable motors which anyone with tools can remove. If you have any other Atlas product in your home, you can use the same motor to other machines too. Besides, this pasta maker can produce pasta in nine different thickness types. The Imperia Pasta maker machine allows you to make fresh pasta in your own kitchen. It can make different kinds of pasta and also comes with a recipe book which will help you to get started, and maybe that’s why fans call this machine Cadillac of pasta makers. This machine is made of heavy-duty steel which durable and very easy to clean, comes in three different colors, red, silver, and white. It allows you to make any types of ravioli. Clamps hold the pasta maker safely to the table and it also has rubber feet which will reduce unexpected slipping. Its wooden grip handles provide comfort and sturdiness when you turn it and the pasta maker comes with an extension plate with that you can easily guide your dough through the machine. Using the clamp for the first time is little confusing. This Vonshef Pasta Maker is very sturdy and designed to suit any kitchen. Using this pasta maker is easy. Get your dough ready and with no time you will be cranking pasta out. It has a feature to adjust pasta noodles at a varying thickness, which is amazing for new pasta recipes. A table clamp comes with this pasta maker, which will hold the machine to the table or countertop. To measure the ingredients it also comes with a measuring tool. Equipped with four pasta roller, you can use one. This machine is made of stainless-steel and cleaning or maintaining this machine is very easy. The Vonshef Pasta Maker has 2 years warranty also. Some people need a pasta maker which is not only easy to use but fast and consistent, to fit their busy lives. If you are one of them, then good news, we have Philips pasta Maker for you. Philips Pasta Maker is recognized for its classy modern design. It is easy to use because it’s fully automatic. You just have to add the flour and liquids and the machine will do the rest. Four shaping disk comes with this pasta maker so that you can make, spaghetti, fettuccine, lasagna and penne noodles with this machine. Philips pasta maker has a built-in drawer for storing shaping disk, has non-slip feet, and comes with a special cleaning tool. This pasta maker is equipped with a 200-watt motor, it has the power to exert 1600 Ib. This powerful and efficient machine can make a half pound of pasta within ten minutes. Cleaning this machine takes some time. At last, we have the ultimate pasta maker that made its way to our 10 best pasta maker list. It is the Marcato Atlas Pasta Machine. It is a dependable pasta maker that produces perfect fresh pasta in every use. It is very simple to use and easy to clean. This machine is made of chrome plated steel which comes in 9 different colors. Roller and cutters are built of the anodized aluminum alloy which stops metal residue from being released on onto the dough. This pasta maker can easily make pasta in 3 shapes, traditional lasagne, Fettuccine, and Tagliolini. A clamp which will hold the pasta maker safely to a table or countertop is included. Also very easy to clean, can use a damp cloth to clean it. It requires two people to make pasta smoothly. There are few thing that you should consider while buying a pasta maker. The first thing is to know that there are two types of machines to make pasta. The first type is Roller. In this case, the dough is prepared and then the pasta machine is used to fine-tune the dough until a very thin sheet is obtained, from which the pasta of the size, shape, and length of your preference is cut. On the other hand, extrusion dough making machines are more professional; they usually prepare the dough and then pass it through discs that are responsible for forming the different types of pasta, these are machines that work automatically. Most pasta machines for domestic use are of the roller type, so the next decision is whether you want manual or electric. 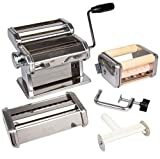 Manual machines usually work by turning a handle that in turn operates the rollers to prepare the dough and then cut it, either using cutters included or independent accessories to prepare another type of pasta. The main problem of a manual pasta machine is that it must be operated on a stable surface, usually, it adapts to a table or to the same bench of the kitchen and it is generally convenient to use it between two people, one to hold the dough/pasta while the other turns the crank. Electric pasta machines can be extrusion or roller. They have the advantage that they are more stable and easier to operate for those who use them. Be careful with metal chrome finish, because they should be more careful so they do not suffer corrosion. The plastic ones are usually cheaper, but it is also easier for some part to break in the process of making the pasta. When working with dough, there is no way to prepare fresh pasta without the machine getting dirty and if the main parts are not removable, cleaning them can be a complicated task.